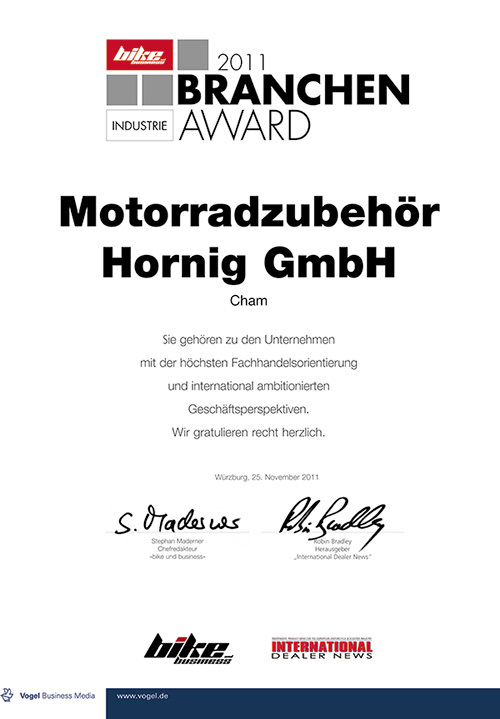 On 25th of November 2011 our company was awarded the „Branchen-Award Industrie 2011“. This „bike and business“ award is given to companies which are specialized in trade and international markets. On Monday 18th April 2011 we were awarded with the 2nd price of the annual Website Award at the IHK Regensburg building. We are glad that we could improve our ranking compared to the last year and we are very proud to have one of best websites in Bavaria. The NEG Website Award was awarded by the E-Commerce-Kompetenzzentrum Ostbayern in collaboration with the Bundesministerium für Wirschaft und Technologie (Federal Ministry of Economy and Technology). The criteria for the NEG Website Award are quality, usability and much more of the website from. Altogether more than 2.000 companies took part in 2011. The selection for the competition "Großer Preis des Mittelstandes" 2011 brought lots of joy to us. The annual nationwide contest by Oskar-Patzelt-Stiftung "Großer Preis des Mittelstandes" is the most demanded economy award within Germany. That is testified by the 3586 companies from all 16 states, that have been nominated in 2010's competition. Taking part on the competition evidences the comparison of companies with same or different branches, regions and size of enterprise. Our company's nomination was already a great honor and a big chance to enthuse regional and national medias and companies. The contest not only asks for business administrational success, but also rates the company as a whole. We are now striving to satisfy the contests criteria, like company's overall development, employment creation and protection, innovation, commitment, marketing, service and customer focus. Which companies will be awarded by Oskar- Patzelt-Stiftung with the "Großer Preis des Mittelstandes“ will be decided in twelve regions by twelve juries and a final jury. The award ceremony will be held in september and october 2011. It was our pleasure to be awarded the "Ostbayerischer Website Award 2010" in April 27th, 2010 in Regensburg by the E-Commerce-Kompetenzzentrum Ostbayern. Advertised by the Netzwerk Elektronischer Gesellschaftsverkehr, the NEG Website Award awards the high quality websites of small- and medium-sized companies from manufacturing, trade and handcraft. Small- and medium-sized companies are classified as separated enterprise with a maximum of 250 employees. Motorcycle Accessories Hornig ltd. belongs to that target group. Our company joined the competition and made, despite of fierce competitors, the 3rd place of East-Bavarias best website. Around 2400 companies joined the competition nationwide. Assessment criterias were quality of targeting, usability, navigation, composition and technical conversation as well as the websites safety. The websites with the best overall impression according to the criterias have been awarded. Encouraged by the success, we are trying to improve our website's usability concept. The consultancy Shoplupe with its media partner Internet World Business searched the user-friendliest online shop of the year. The Shop Usability Award is part of an institution in e-Commerce-life of medium-sized shop operators. Including us, more than 270 online shops applied last year for the Usability Award 2010. All submitted applications firstly have been rated by Shoplupe usability experts and then the applications were forwarded to a specialized jury. In particular the shops have been requested by the jury to create a customer-friendly and lovely designed online shop. Besides an overall winner, there were thirteen winners in the single categories. In the category Spare Time, Hobby & Pets our company convinced the top-class jury. Our online shop grew, created with creativity and attention for details. We are proud and happy about being the category's winner and we are pleased to be awarded the Usability Award 2010. Of course, we will further work on our online shop's improvement.